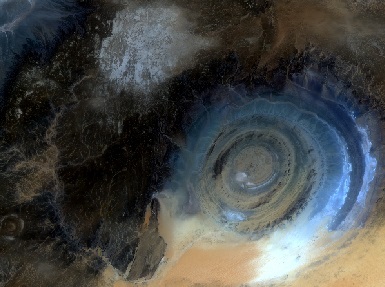 Eye of the Sahara from Landsat 8 on 7th July 2015. One of my favourite facts growing up was that the Great Wall of China was the only manmade feature visible from space. Of course, I now know that everything about that statement was wrong, and it is not a fact at all! Firstly, it is actually very difficult to see the Great Wall of China from space due to the narrowness of the wall and the pixel size of satellites. For example, Landsat has a pixel size of 30 m meaning that it is impossible to distinguish anything smaller than 30 m and features need to be significantly larger to be visible. The astronauts astronauts Chris Hadfield from Canada and China’s Yang Liwei, both said they could not see the Great Wall with the naked eye when orbiting the Earth. US astronaut Leroy Chiao took a picture of the Great Wall from the window of the International Space Station in 2004; however, even this needed to be magnified to be able to see the Great Wall. Sadly, the other side of my childhood fact is also untrue; there are a number of manmade features that can be seen from space, including the Great Pyramids at Giza, the greenhouses of Almeria in Spain and Palm Tree Island in Dubai. There are, of course, also many natural features visible from space. From the obvious Great Barrier Reef, Uluru (also known as Ayres Rock) and the Grand Canyon; to the more unusual and less well known features such as the Eye of the Sahara, which is the image at the top of the blog. I become aware of the Eye of Sahara, also known as the Richat, through a recent New Scientist article. It’s a 40 kilometre wide series of concentric rings of rocks of different ages, located in the Sahara Desert near Ouadene in Mauritania. It’s not known precisely how this feature was created, nor why it is so circular; however, it is an interesting anomaly visible from space. The concept of exploring unusual Earth features seen from space is the basis of a new television series due to begin on Discovery UK at the end of this month. The series, Into The Unknown, will see presenter Ed Stafford travel to unusual and unexplained landscape features that have been spotted from satellites. Who says there is nothing left to discover on Earth? Start scouring your satellite pictures; you never know what you might discover! This entry was posted in Data, Earth Observation, Education, Landsat, NASA, Remote Sensing, Space Can Help, visualisation and tagged astronauts, Discovery UK, Dubai Plam Tree Island, Earth Observation, Ed Stafford, Eye of the Sahara, Giza Pyramids, Grand Canyon, Great Barrier Reef, Great Wall of China, greenhouses of Almeria, Landsat, Landscape features, remote sensing, Satellites by Andy. Bookmark the permalink.